This is Part 11 of our New York Food Adventures! Check out the rest here! Despite our busy schedule during this New York city trip, I was able to meet up with a high school friend of mine for brunch. 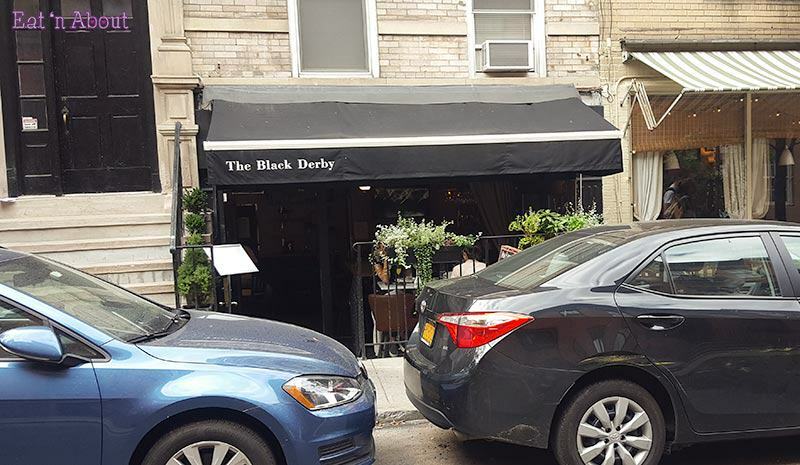 He’s moved to NYC for about 10 years now and so it was up to him to suggest a place near me and he chose The Black Derby. 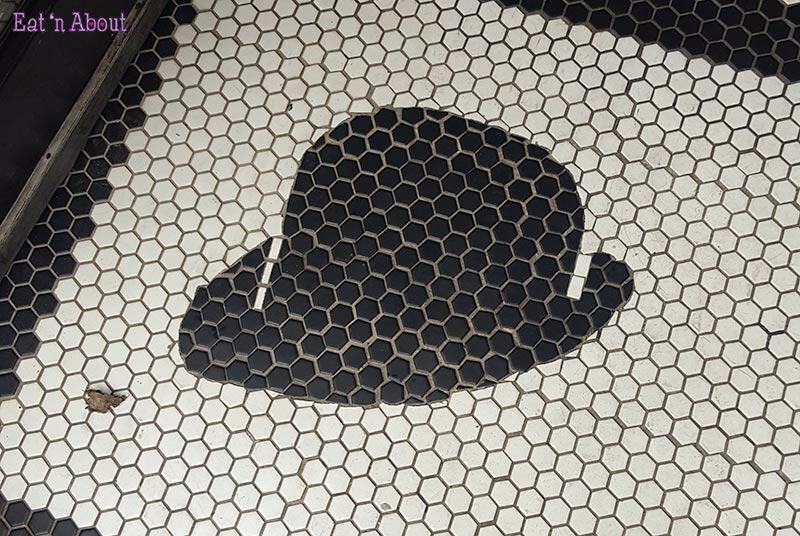 The Black Derby was a small little place on a quiet street. There were two sides to the restaurant and when I first arrived I thought it only consisted of the small bar and 3 other tables. Little did I know there was a whole other section behind a door. 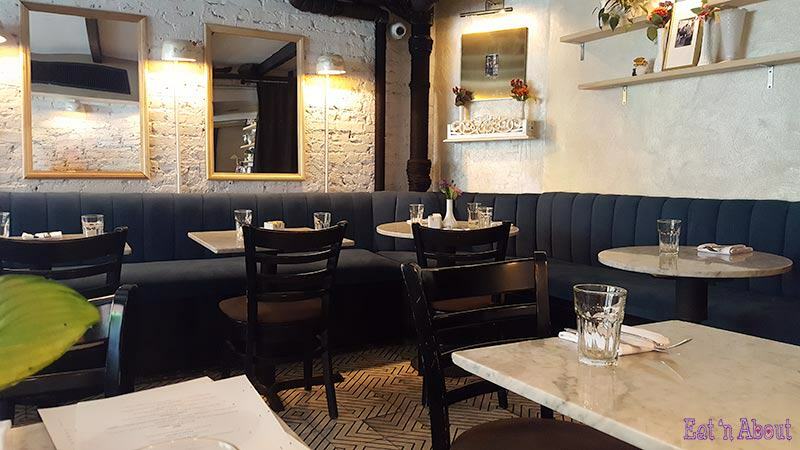 On their menu they also offer a Prix Fixe Brunch for $39USD that includes bottomless mimosas or coffee for 2 hours, an appetizer, plus an entree. However since I will be attending a wedding later that day, I opted out of it and picked a la carte instead. Originally I had wanted to order a coffee, but when I requested non-dairy creamer, I was surprised to hear that they do not have any. I was surprised because most restaurant nowadays have it, and this was New York! Since I couldn’t take dairy, I had an Earl Grey tea neat instead. Also, when my friend asked for fresh squeezed orange juice, we were also told that they don’t have it and only had what came in a box, and that “it was still good orange juice”. Now we’re not snooty people and boxed orange juice would’ve been fine. But it was just surprising given the type of restaurant and the meal we were having. Anyways on to the food. For my main I had the Scandinavian Benedict ($19usd). 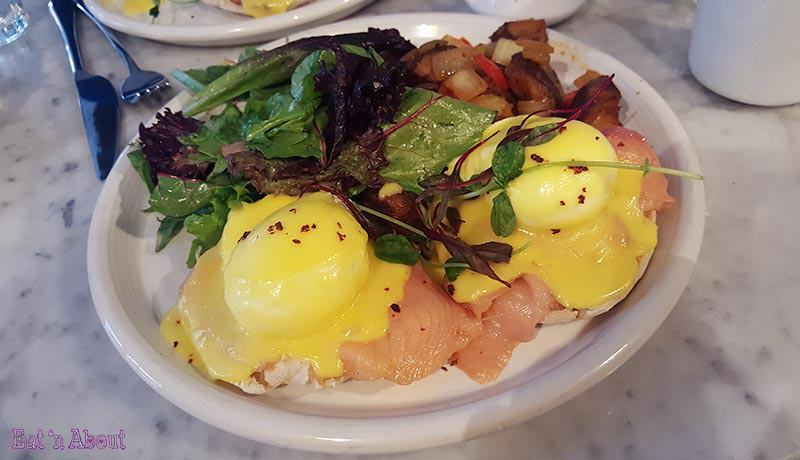 It was a simple benny with smoked salmon instead of back bacon. It came on top of toasted english muffin (of course), served with a salad and home fries. 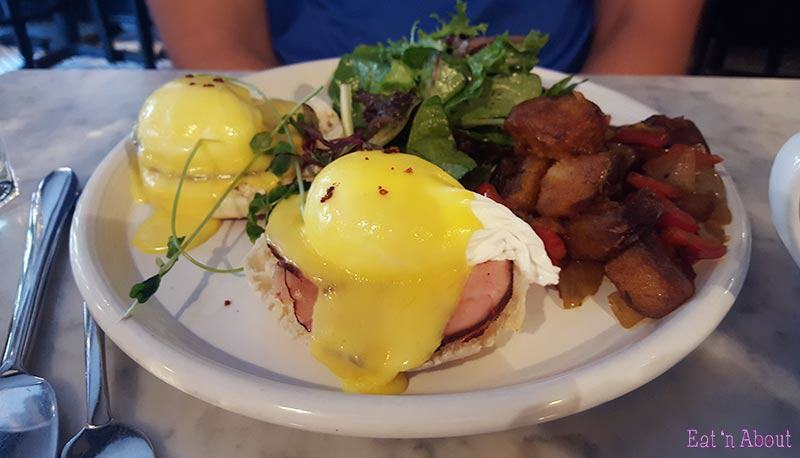 My friend had their Classic Benedict ($18usd) which had the usual back (“Canadian”) bacon. The rest was the same. The runny yolks were done well and for the most part the meal was yummy but really nothing extraordinary.